Experience Purple Haze Lavender as our personal guest in the Farm House. Enjoy Agri-tourism, where you not only stay in a beautiful rural setting, you can also watch firsthand the operations of a working Lavender Farm. Drive down through the fields of lavender on your personal driveway to the charming farmhouse. There is plenty of private parking for up to 4 vehicles. The gardens will quickly call to your senses, as will the cozy front porch with Adirondack chairs and porch swing. Upon entering the house you'll see the living room with river rock gas fireplace, leather sofa, and two cozy chairs. Make yourself at home, and feel free to put your feet up. Off to the left of the entrance is the den with comfy chairs and a large sofa. In the den there is also a large entertainment center with TV, Direct TV, DVD player and radio. You will find games, books and movies for your enjoyment as well. The dining room and kitchen share an open floor plan with the living room-ideal for entertaining. You may comfortably sit around our large farmstyle dining table. The gourmet cook will feel quite at home in our fully equipped kitchen. Everything you will need to cook up your favorite meal is there for your convenience. Located off the kitchen is a 3/4 bath with shower and a newly installed steam room. Downstairs also has a washer and dryer. Upstairs are 3 bedrooms, which share a full bath. Two bedrooms have queen size beds, and the third has a king size bed. All linens are of the finest quality and range from 400 to 600 thread count. Plenty of extra linens are in the closet should you need them. We can also supply a travel crib upon request. Outside enjoy the aroma of the farm, wander the herb and vegetable gardens, as well as the fields of lavender. If you see a tasty addition to your dinner, feel free to pick it from the garden. The large deck off the back of the house has the utmost privacy, and is equipped for wonderful outdoor dining and entertaining. The large table seats six and the gas BBQ is ready for grilling. The hot tub is new, and beautifully fits into the landscape of the deck and gardens. You are more than welcome to bring along your pets for an additional $100 fee per stay. Please be respectful of our beautiful grounds and pick up after your pet. All pets must be kept on a leash when outside of the house as we are a working Lavender Farm and there is no fenced yard. We want to make sure that ALL of our guests stay safe. There is a wonderful large open field in front of Purple Haze that at certain times of the year is filled with beautiful Roosevelt Elk! A beautiful view of the Olympic Mountains! 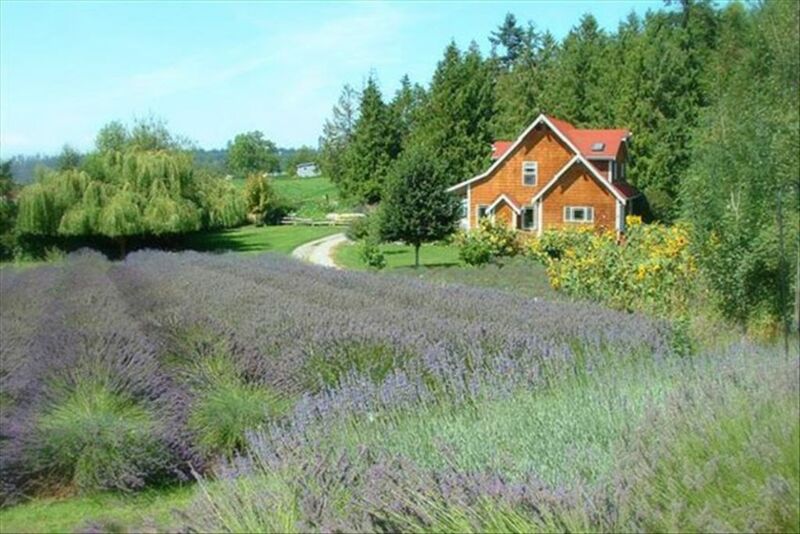 12 acres of beautiful lavender fields, herb garden and pond. We are located on the Olympic Discovery Bike Trail. Bring your bike and ride for miles! The perfect jumping off point for exploring the peninsula! We really enjoyed our stay at Purple Haze. The house is comfortable and well-equipped and had plenty of space for our family of four. Despite the picturesque setting, it's actually only a few minutes from the grocery store and lovely downtown Sequim, too! Highly recommend. Well maintained and beautiful home. Perfect family getaway in a great location! Thoroughly enjoyed our stay! We are so happy that you enjoyed your stay with us and hope you will be able to return again....maybe in the summer when the lavender is in bloom! A beautiful, well-maintained house on a working lavender farm. Be prepared for members of the public wandering around during the day and lots of privacy at night. Wonderful family reunion at the lavender farm! Kids loved the chickens. Very relaxing! We arrived from New Hampshire and California to visit family in Port Angeles. Everyone loved the lavender farm! So relaxing, peaceful coffee on the front porch, cookouts on the back deck, hot tub before bed. Fun outings to the beach at Dungeness Spit and Port Angeles Harbor. Seals and eagles! We will be back. Thank you for a wonderful family reunion! That is exactly how we envisioned our farmhouse being used when we decided to make it a vacation rental! Your kind words make all the work that it takes to do a small farm so worth it! Thank you for making our hearts happy! The photos don't do this wonderful place justice. It was what I expected from the photos and write up and so much more. After a busy couple of days surrounding my sister's wedding this was our go to place to relax and catch up(we are 4 siblings living in 4 different states). I got a lot of brownie points for finding and booking Purple Haze. It has a wonderful kitchen we found to be lacking nothing. The grounds, gardens and fields of lavender are breathtaking. Dont know how light a sleeper you may be but there is a rooster and some noisy peacocks near the house but I just went back to sleep because the bed was so comfy. I made use of the steam room and hot tub enjoying relief from all my traveling. The only drawback is that although there are signs on the front and back doors, from 9-5 when the farm is open you and the house become tourist attractions! The floral gardens are in front of the house and the area that the birds are in is in close proximity to the back deck and hot tub. When I find myself back in Washington state I will also be back at Purple Haze! Charming and had everything you needed for a relaxing stay. It was located on a charming plot of land surrounded by lavender, flowers, and a vegetable garden. There was plenty of space for 3 couples to have a fun weekend. The kitchen was well stocked with things to use. The hot tub was very relaxing. We had good cell service here but there is no WiFi. I would highly recommend to anyone and would love to go back! Thank you so much for your kind review. I am sorry you were not able to access the wifi-there is no password, so it should have just popped up as one of the options. It does tend to be stronger on the south side of the house! But glad everything else was enjoyable-hope to see you again!